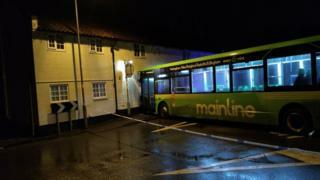 A teenager has pleaded guilty after driving a car into a bus that then crashed into a house. Brett Woodhouse, 18, admitted driving uninsured and without a licence when the Trentbarton bus hit a home in Radcliffe-on-Trent on 26 January. Police said there were about 15 people on board and at least one woman was injured. Woodhouse also pleaded guilty to failing to stop for police before and after the crash. Woodhouse, of Loughborough Road in West Bridgford, pleaded guilty to four charges in total at Nottingham Magistrates' Court. "Causing injury to a female" was added to the charge of failing to stop after the crash, which Woodhouse admitted. Woodhouse was granted conditional bail and will be sentenced at the same court on 1 March.